Last time we checked in on everything agency Giant Spoon, they had just returned from SXSW having created an impossibly immersive Westworld experience. The news coverage consensus branded it as “the greatest activation ever.” But Giant Spoon has no interest in resting on such laurels. They recently doubled down and built The InkHole in Los Angeles, a seedy pop-up tattoo parlor and speakeasy ripe with degenerate puppets engaging in all modes of adult behavior. The IRL experience was part of an extensive marketing campaign to fluff audiences for STX Entertainment's new film The HappyTime Murders, starring Melissa McCarthy, Jim Henson's beloved muppets, and a hard R rating. Can you share a bit about Giant Spoon’s latest project for STX’s new film The HappyTime Murders, starring Melissa McCarthy. The Happytime Murders is set in the underbelly of LA, where puppets and humans coexist. We knew we wanted to create a space where the puppets were very much alive, real, and especially, uninhibited. We created The InkHole, a pop-up tattoo parlor meets secret speakeasy, where guests could indulge in puppet pleasures––right alongside those puppets. There was Blackjack, booze, a Sugar Den to get ‘high’ on candy, live performances, a peep show hallway, a photo-op with puppets, and a not-safe-for-kids DVD shop. How did you manage to capture the playfully raunchy tone of the R-rated puppet film in this real life setting? Puppets have this way of bringing humor and delight to almost any setting, so it was crucial they were a part of this. For an R-rated film, though, we knew we had to bring in an element of shock. STX Entertainment was trusting enough to let us take the handcuffs off, so to speak––our puppets could be as raunchy as they wanted. They weren’t neutered, and that is what made this activation special. Despite the film’s nature, it’s still one produced by The Jim Henson Company. We were lucky enough to have maybe the most professional puppeteers in the business working behind-the-scene at The InkHole. They were steadfast in ensuring each guest was taunted, played with, laughed at, and shown a good time. What were participants’ reactions to the activation? There’s this look that crosses people’s faces when they step inside an activation, which can only be described as pure happiness mixed with a bit of shock. Almost everyone who visited The InkHole had that same expression. And the phones immediately came out. We knew we were pushing the envelope with this one, but the fact that almost everyone said “Oh my god!” every time they turned their heads is reassurance that we succeeded. What were some of the insights taken from your Westworld experience at SXSW that you built on? If we learned anything from SXSWestworld, it’s that the devil’s in the details and fans notice everything. We wanted The InkHole to be an environment where people could create their own content. There were moments for Boomerangs, aptly-lit ambiances, and a photo-ready couch where guests could shoot the “fluff” with the Rotten Cotton Girls. Similar to the Easter eggs at our Sweetwater, certain rooms were hidden, like the Sugar Den, or only allowed admittance with an invite. Logistically, like SXSWestworld, our event was an exclusive one. While we had limited capacity, we also wanted to be sure the maximum number of Angelenos could visit. Lucky for us, our experience was extended for an extra weekend. Why do you think that IRL experiences have become such a central part of driving people to screens? What can they accomplish that a trailer or press tour simply can’t? Experiential film marketing delivers a tangible glimpse that goes far deeper than that of a trailer view. It provides for two-way interaction and engagement versus the one-dimensional experience of a press tour. Once consumers step into an activation and its created world, they become hooked––and the 2-hour film they want to see becomes a continuation of the journey they just went on. How has Giant Spoon established itself as a key character in delivering these kinds of unforgettable experiences? There’s a secret sauce that we use across the board, and it has to do with thinking about the consumer on the receiving end of everything we’re creating. It helps us make our work––be it social, digital, or experiential––truly unforgettable. What do you see as Giant Spoon’s creative mission at this stage? What do you feel is missing and what do you want to take up and deliver? Giant Spoon’s ethos is that it’s an agency that aspires to not make ads. We’re obsessed with culture and use it to strategically leverage media, technology, and creativity to solve business problems. Simply put, we’re making things that people want to share and engage with. While we have a lot of clients, we don’t have a lot that use us for everything. There’s opportunity to work with clients end-to-end, across strategy, media placement, and content and experiences to create the ultimate work, while showcasing what we’re capable of. What separates Giant Spoon from other agencies? Our people, hands down. We care about each other and what we’re building. What about the culture of Giant Spoon makes it a desirable place for prospective hires to work? Giant Spoon takes a ‘no silo’ approach to marketing. Yes, our employees are given titles, but they are free to develop a holistic skillset by collaborating and learning from experts in each department. What does it take to succeed at Giant Spoon? What qualities are most important in a prospective hire? We look for those with ‘no task is too small’ mentalities. Self-starters who take the initiative and get the work done, no matter if it's their job or not. What’s next for Giant Spoon? 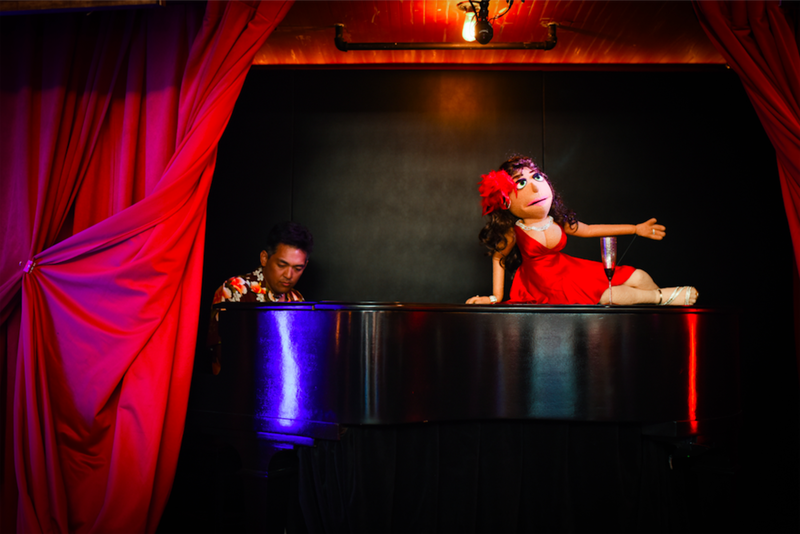 An R-Rated puppet bar in Hollywood could probably live permanently, right? The past few weekends have us thinking that people would pay regular visits.